Out of home advertising : Big-screen commercials in k.l. Asia is, in many ways, the home of Digital Out Of Home (DOOH) advertising. From the huge flat-panel networks of the region’s airports to the giant LED walls that line buildings in shopping districts such as Tokyo’s Shibuya, the region has more than just an appetite for AV in public spaces—it has a well-justified reputation for innovation. Over the last couple of years, many specialist content creators and advertising agencies have sprung up, and a typical example is Malaysia’s DanaScreen, which has LED screens showing customised content in a number of key locations around the Golden Triangle, the commercial heart of Kuala Lumpur. 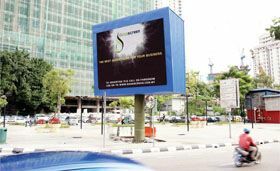 For its latest installation, DanaScreen has chosen a Lighthouse Technologies P19 19mm LED screen to act as a stand-alone advertising billboards, situated on Jalan Ampang, a major K.L. traffic artery. Installed at the beginning of July by Malaysian systems integrator Jua Wangsa, measuring 5 x 5 panels (6.10m (w) x 4.57m (h)) and driven by a Lighthouse LIP-XGA and XDrive Pro, the screen is a pure advertising outlet in one of this vibrant city’s hottest hotspots. Jua Wangsa is a young company, having been formed at the end of November 2005, and this was its first foray into the world of systems integration. But Ahmad Husni Abdul Wahab, Jua Wangsa’s Founder, has a wealth of experience in the retail and IT industries and, with the help of the Lighthouse’s SESA team, has completed a successful job. Malaysia’s DanaScreen operates a number of DOOH sites at key points around Kuala Lumpur’s ‘Golden Triangle’. Wahab explains, “although I’ve seen them in action before and had helped to demo a unit. But I had never been involved in their setup or configuration. However, I quickly understood how they work from Lighthouse’s brochures. Essentially, this is a monitor in the same way as any other, and how you want it to look totally depends on you. “Installing the screen was an easy process; the only tricky part was assembling the structure and integrating the screen into it. I must admit, I took a bit of a gamble by taking this job, but we have gained important experience and knowledge, and now I’m hoping to concentrate on this market for Malaysia.